Maine Gov. 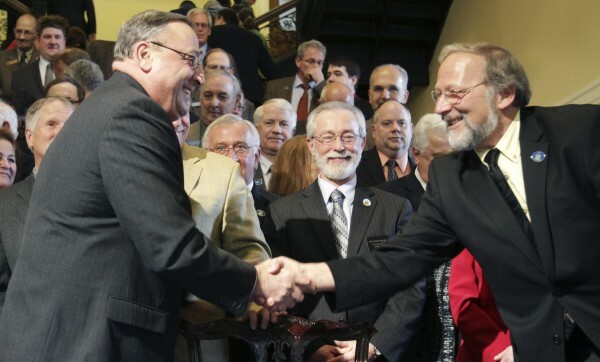 Paul LePage, left, is congratulated by Rep. Paul Waterhouse, R-Bridgton, right, after signing the health insurance overhaul bill at a State House signing ceremony in Augusta, Maine on Tuesday, May 17, 2011. LePage is surrounded by fellow Republicans. Maine Gov. 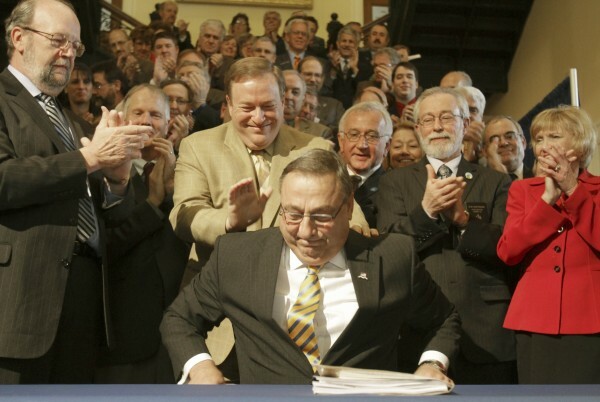 Paul LePage holds up the health insurance overhaul bill that he just signed at a State House signing ceremony in Augusta, Maine on Tuesday, May 17, 2011. LePage is surrounded by fellow Republicans, at left is House Speaker Robert Nutting, R-Oakland and Senate President Kevin Raye, center, R-Perry. Maine Gov. 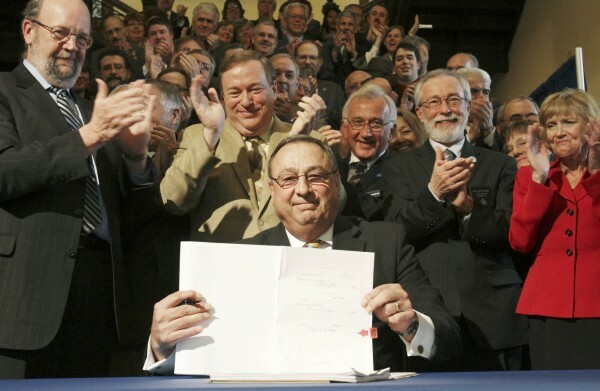 Paul LePage smiles as he in congratulated after signing the health insurance overhaul bill at a State House signing ceremony in Augusta, Maine on Tuesday, May 17, 2011. LePage is surrounded by fellow Republicans, Senate President Kevin Raye, center, R-Perry. Maine Gov. 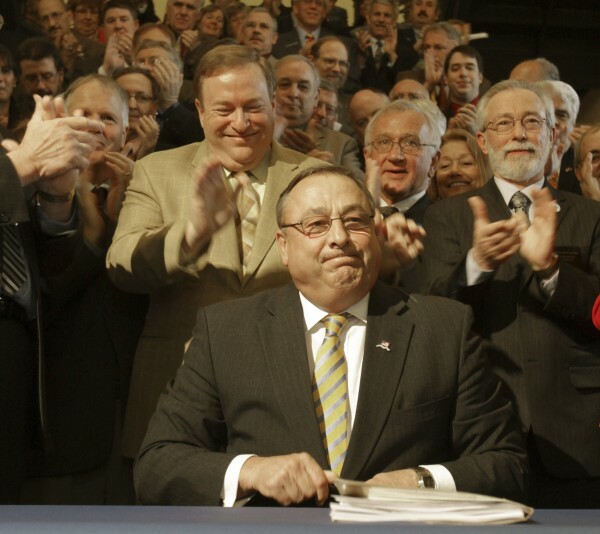 Paul LePage smiles as he is congratulated after signing the health insurance overhaul bill at a State House signing ceremony in Augusta, Maine on Tuesday, May 17, 2011. LePage is surrounded by fellow Republicans, at left is House Speaker Robert Nutting, R-Oakland and Senate President Kevin Raye, center, R-Perry. AUGUSTA, Maine — Calling it a top priority of his administration, Gov. Paul LePage on Tuesday signed into law a bill designed to lower health insurance costs and cover more Mainers through a series of market changes including a new high risk pool and allowing smaller companies to band together to get better rates. Backed by dozens of Republican lawmakers who supported the bill, LePage thanked party leaders who shepherded the bill through grueling House and Senate debates, making it the biggest political trophy for the GOP so far this session. “This legislation has been a top priority,” the governor said during the State House bill-signing. But even before LePage had signed his name on the bill, Democrats branded it “reckless” and said it would hurt Mainers over age 48 and those living in rural areas, who stand to see higher rates. They also took aim at a provision to add a $4 charge to the monthly premium of every Mainer with private coverage. The fees will pay for a high risk pool that will cover Mainers with high health care expenses. Meanwhile, the health care activist group Maine People’s Alliance said it’s considering launching a people’s veto referendum campaign to stop the law from taking effect. Calling the bill a “handout to the insurance companies,” the alliance also expressed worries about the impact on older and rural Mainers. “There’s only one way to stop it now, and that’s at the ballot box,” read a blast email from MPA executive director Jesse Graham. The organization is seeking volunteers willing to gather the approximately 60,000 signatures needed to put the issue before Maine voters. By state law, the gathered signatures would have to be submitted to the Secretary of State’s office within 90 days of the adjournment of the current Legislative session scheduled for June 15. “We’re just testing the waters … it would be a significant undertaking,” Graham said in a phone conversation. Among other supporters of the new law, the insurance industry likely would fund a major campaign to defeat the referendum, he predicted. Nearly 6,000 people, including about 1,500 members of the Maine Small Business Coalition, signed a petition last week in protest of LD 1333 prior to its approval by the Legislature. The coalition represents about 2,500 sole proprietors and small businesses with an average of four employees. “A huge number of our membership is deeply concerned” about the provisions of LD 1333, which would disproportionately affect older Mainers in rural areas, said coalition director Nathan Libby. House Speaker Robert Nutting, R-Oakland, said the bill is based on proven systems in dozens of other states where rates are lower. But Senate Democratic Leader Barry Hobbins of Saco said the bill was rushed through without a comprehensive actuarial analysis by the state Bureau of Insurance. 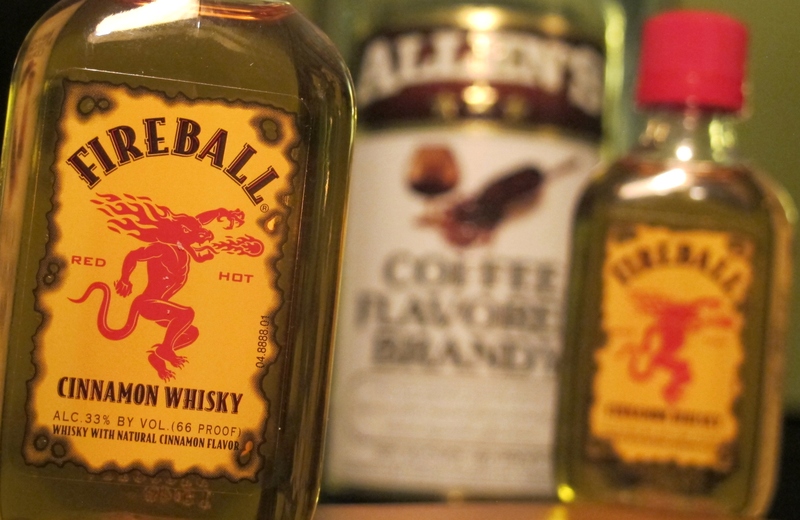 BDN reporter Meg Haskell contributed to this report. Correction: An earlier version of this story should have stated that opponents hopeful of launching a people’s veto of the measure have 90 days from the end of the current legislative session to present signatures to the office of the secretary of state.